Today we are celebrating the Red Carpet as we all gather around to watch the Oscars. My family likes snacking when we watch tv. Normally, Frank makes popcorn but today is not just any Sunday when you sit around watching tv...tonight is Oscar night, so I decided to amp it up a bit by making Roasted Red Pepper Pinwheels. Or that was the plan anyway but sometimes my plans go awry. The good thing about Sunday Supper is that it is normally a casual affair eaten with family and close friends so if things go wrong it is not really a tragedy just a minor inconvenience or as in this case....A Happy Accident. Aren't these the saddest little pinwheels you have ever seen in your life?? But the taste was perfect....So never judge a book by it's cover. I made my garlic herb cheese and I attempted to spread it onto the roasted red pepper and make pinwheels but they didn't turn as I had hoped. I don't know if it was because I tried to cut corners and use jarred red peppers or if it was because my idea was off. Whatever the reason the pinwheels were not as beautiful as I had imagined. But I popped one into my mouth and it was heavenly. The herb cheese melted into the roasted red pepper and it was just divine. So I put on my thinking cap and decided to create a new dish. I threw everything back into the food processor, pulsed it a few times and Voila!! 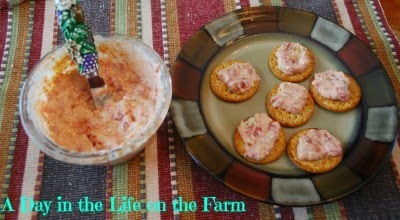 Roasted Red Pepper and Herb Cheese Spread....Life is good. Please check out all the other great Red Carpet recipes at the bottom of this post. And since victoriously turned this recipe around I am going to share it at Small Victories Sunday. So glad you made lemonade out of lemons. Yep, it only took me 50 years of cooking to relax enough not to sweat the small stuff and to learn that it is all small stuff. Definitely a happy accident! Your "spread" sounds divine, Wendy!!! You could put that cheese on anything and it'd be a winner! Mistakes still make for the best dishes!!! I still love it! Good for you in being creative, love your cheese spread! I love when you can make something fantastic out of something that did not work. Sounds like you hit a home run with this one. NEVER judge a book by it's cover, especially with food! I bet the combination was delish! Never judge a book by its cover is right. I think we've all experienced such things. The important thing is the taste. I'm sure these were delicious! They were very delicious Renee. I adore roasted red peppers! These pinwheels are perfect! 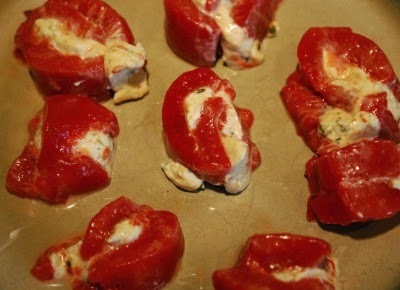 The roasted red peppers paired very nicely with the herbed cheese. I love this recipe. Roasted Red Peppers are so flavorful. I'm a cheese nut so I love that you worked it out. And the flavors melded so nicely together Cindy. It turned out delicious. So glad you were able to make something delicious anyway! Honestly, I think it sounds better as a spread than it would have as pinwheels. Just me, of course. I think the tastes are the same but putting it on crackers was really delicious Bernadette. Hooray for the save! Sometimes the best recipes come out of unexpected results like this one. Thanks Katie, you are right. You are such a clever woman. I have learned so much from you! Thanks, it was delicious if not beautiful. You made me smile with this post! How great your turned those sad pinwheels into such a great spread. Way to go!! I consider any post that makes people smile a success. Thanks Renee. No More Whining, just the Weekly Menu. #TripleSBites....Let's get this party started!! !